Almost two generations of schoolchildren have been asking how astronauts go the the bathroom in space. (Ditto for cosmonauts and taikonauts, no doubt.) It's no mystery. Plenty has been written on the subject. 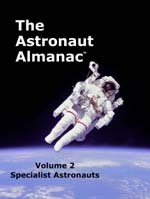 Even before reaching outer space, an astronaut is likely to have problems with urination. When seated in their acceleration couches before liftoff, astronauts are on their back, with legs elevated above their trunk. This position enhances blood flow to the kidneys, which respond by increasing production of urine. Staying in such a position for hours is likely to fill the bladder to capacity. The movie The Right Stuff, famously (and humorously) depicts Alan Shepard's confrontation with this problem, in the first American manned space mission. (In the movie, Shepard's pre-flight coffee intake was blamed for his urge.) Shepard was ultimately forced to urinate in his space suit. When Dr. Zebra worked at the Johnson Space Center in 1982, he was taken on a tour of the Hamilton Standard Company, the makers of the astronaut spacesuits. He was told that the male astronauts of the 1960s and 1970s had worn a condom catheter under the spacesuits they used for space-walks and moon-walks. Condom catheters have been routinely used by men in hospitals for years, but there is no analog for women despite the fervent wish for one by many physicians, nurses, and patients. So, with the "can do" attitude characteristic of the American space program of those years, the Hamilton Standard engineers set out to solve this problem of plumbing that had so far resisted solution on earth ... and they succeeded. Dr. Zebra's guide told him that the new device would fit into the opening of the female urogenital tract and remain in place. To describe the shape of the device, he made his hand into the shape shown, and described it as looking like "a venus fly-trap, with spikes." The proud engineers, presumably all male, approached various secretaries in the company to be test subjects, but after one look at the device, all the secretaries said no. They probably said something a little stronger, as the project was dropped, and a diaper system (then called DACT: disposable absorptive collecting something-or-other) was fielded. In the microgravity environment of space, it is apparently possible to move oneself around by farting. For this and other reasons, the toilet on space station Mir had restraining devices. "The restraining devices also serve to keep the user from being thrust away from the toilet seat when what could tactfully be described as digestive gas thrusters are fired" 1b. The trials and tribulations related to so mundane an act as toothbrushing remind us that nothing about space travel is routine. On the 14-day Gemini 7 flight, Jim Lovell lost his toothbrush. So he and crewmate Frank Borman shared the one remaining toothbrush for the rest of the flight 3a. On Mir, astronaut Michael Foale kept his toothbrush and personal gear in a module of the space station known as Spektr. The famous collision between Mir and an unmanned "Progress" space vehicle caused an air leak in the Spektr module, and it had to be sealed off. Foale's personal gear was now open to the vaccum of space and inaccessible. He resorted to using the toothbrush from the Russian toiletry kit left behind by one of his predecessors (Linenger), but within four days had worn it out 4a. In recovering from the near-disastrous collision, Foale compiled a list of the items most urgently needing re-supply on Mir, and put "a toothbrush" as #6 4b. Shuttle astronaut Mike Mullane reports that astronauts use a regular toothbrush and their choice of toothpaste. The act of toothbrushing is the same as on earth, he says, except there is no sink in which to spit, so one must spit into a tissue 5a. Linenger, Jerry. Off the Planet. New York: McGraw-Hill, 2000. Shepard, Alan B. and Slayton, Donald K. Moonshot: The Inside Story of America's Race to the Moon. Atlanta: Turner Publishing, 1994. Collins, Michael. Lift-Off. New York: Grove Press, 1988. Foale, Colin. Waystation to the Stars. London: Headline, 1999. Mullane, R. Mike. Do Your Ears Pop in Space?. New York: John Wiley & Sons, 1997.